Lybramatic INDUSTRIAL STRENGTH dishwashing detergent is engineered to clean up what regular detergents can't handle. This detergent is specifically for INDUSTRIAL AUTOMATIC dishwashers. Industrial-grade formula dissolves foods, stains and provides sparkling clean dishes. No pre-rinse needed Biodegradable auto dishwasher detergent. Best way to clean up with no spot afterwards. Most of the automatic dishwashing detergents currently available are suitable for their intended purposes, i.e., effectively cleaning, and leaving previously soiled eating and cooking utensils in a generally spot-free, clean condition. Our incredible powerful detergent Lybramatic cleans pots, pans, dishes and glassware without scratching, etching or hazing. It cuts through grease and dried-on food to reduce pre-rinsing before loading. 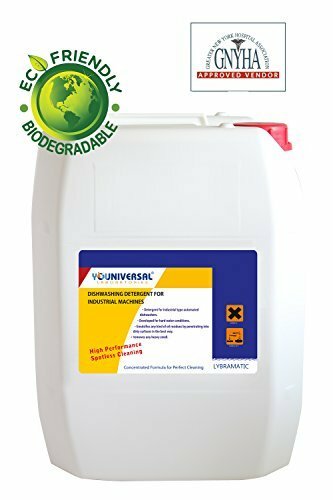 Youniversal presents you high performance spotless cleaning with Lybramatic. Concentrated formula contains strong active ingredients to penetrate grease and grime. LYBRAMATIC emulsifies any kind of oil residues by penetrating into dirty surface in the best way. Lybramatic, is truly a product that combines value for money and great quality at the same time. It is very easy to use and economical. Youniversal is a believer of great quality not need be expensive so if you are just like us, we are sure Lybramatic would also work for you. Industrial-grade Formula Dissolves Food Stains, Grease, Grime and Residue. It Provides Sparkling Clean Dishes and Like New Dining Ware . NO PRE-RINSE NEEDED.. Ready-to-Use. Works Great in both LOW and HIGH TEMPERATURE Commercial Machines. Cost Effective Powerful Detergent for Commercial Uses..
Biodegradable Auto Dishwasher Detergent. Cruelty-free..